It’s been a busy few weeks! Today was our last day of school (for Davey and me). We are all excited to have a couple of weeks off. We’ve had a fun month with lots of fun activities. This included a CWU craft day. CWU students had at least 40 craft stations set up in the Student Union. We could have done crafts all day long if Davey would have wanted to. He didn’t. He enjoyed it for a little while, and then he was ready to go. 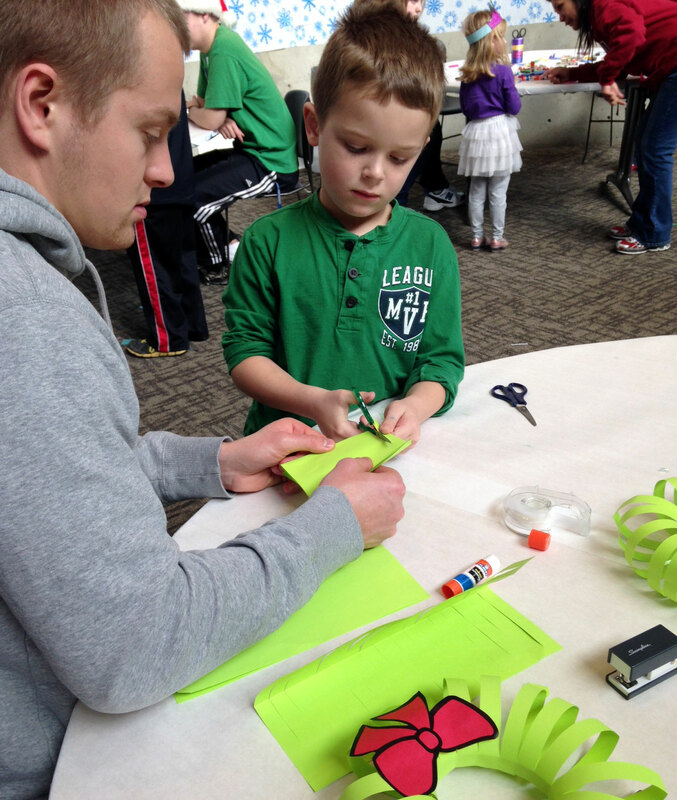 I think his favorite craft was making a wreath with this nice CWU student. He was happy to have a special part for the program. During one song he got to pretend to play a trumpet at the front of the stage, and he liked this. There were about 8 million people at his Christmas program. It was really neat to see so many people there, but David and I were nearly at the back. Next year we need to get in line about 1/2 hour early. I was so happy when a very nice friend told me she’d taken a few pictures of Davey. 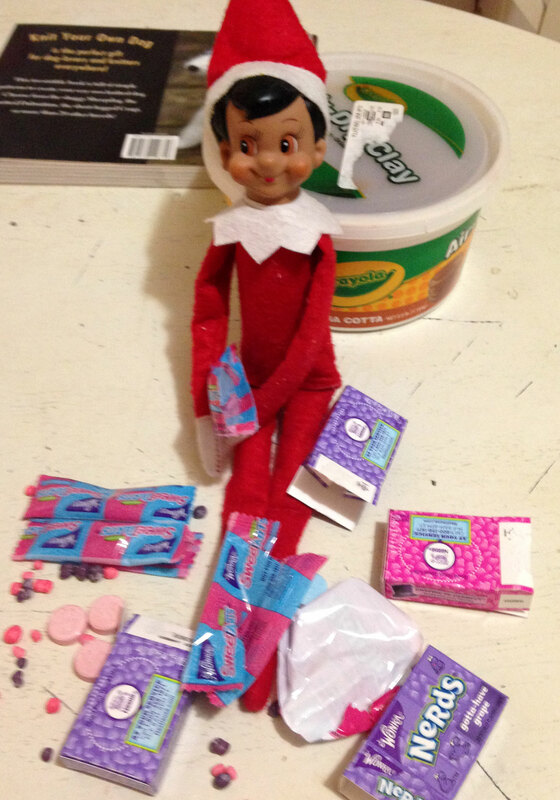 We’ve also been busy with Winkie the Elf on the Shelf. We don’t pretend that Winkie is here to keep an eye on Davey for Santa. He’s just here to hang out and get into mischief every night. Every single night. So every night at about 11 pm, David and I come up with our daily Elf adventure. So far I am proud to say that I have not resorted to pinterest, but I have a feeling I am going to be going there for the last week. One night Winkie got confused and thought he could do “kung fu” if he put on Davey’s yellow belt. Another night, he wanted to get in shape and was doing pull ups on David’s pull up bar. Davey nudges us in the direction he wants to go with Winkie. “Mama, I want Winkie to write me notes,” but then from his reaction you’d never guess that he didn’t completely believe that Winkie was getting into trouble all on his own. One night Winkie got into the candy! Davey has had a lot of fun at school as well. 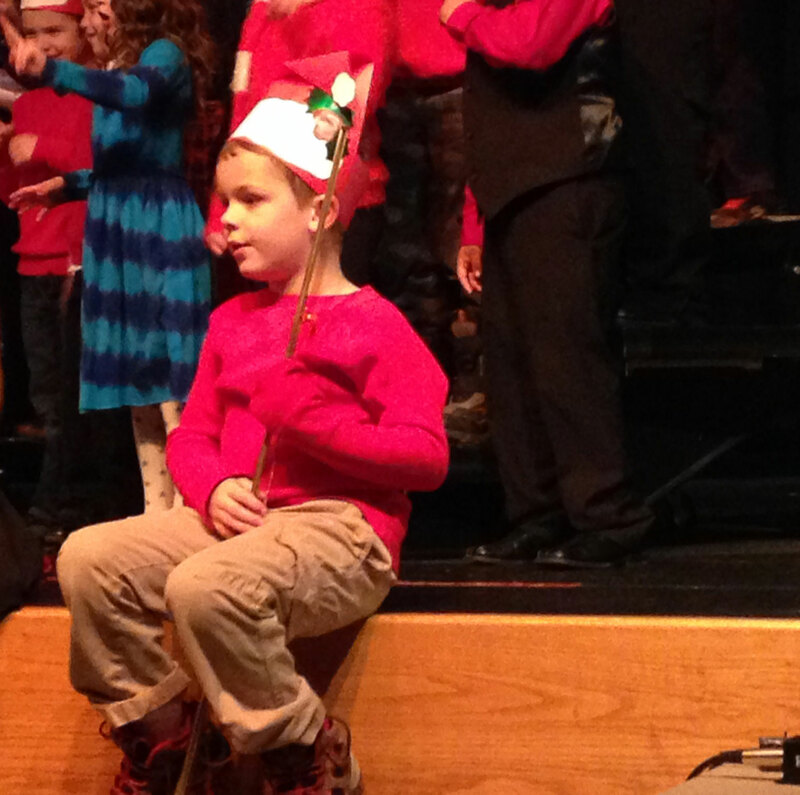 They spent the month learning about Christmas traditions in countries all around the world. Davey shared all that he learned, so it was fun for all three of us. Yesterday, Santa Claus came to visit the kindergarteners. While he was there, he stopped by Davey’s first grade class. It just so happens that Santa knew Davey by name, and he declared that he knew Davey had been a good boy. After Santa left, Davey’s friends and his teacher asked him if he’d been surprised, and Davey said something like, “Nope, he’s my neighbor”. We are fortunate to have a great neighbor who is also Santa Claus! Davey makes celebrating so fun. My birthday is coming up, and Davey wanted to pick something out for me. He wants it to be big surprise, so he keeps talking about it “in code” with David. “Daddy, uh, Daddy, it’s time to go look at the bread at Fred Meyer. Yeah. The bread. Let’s go get some bread.” He thinks this is great fun. Finally, there were tears the other night after I told Davey the forecast for next week. He is just beside himself because he does not want what he calls a “Green Christmas”. “Mama, why won’t it snow? It’s not fair! It should snow on Christmas.” It’s not looking like there is much of a chance of snow right now for Christmas, but I will keep my fingers crossed! Hope you guys have a great holiday off.